This read-only area displays information about the objects to be stamped. This read-only area displays the full path to the active folder that contains the objects to be stamped. If this option is checked, and a subfolder is selected, then the files that belong to the subfolder will be stamped as well. Enter a new date to be used when modifying the time stamp of the selected objects. If you don't want the date to be modified, clear this area. Enter a new time to be used when modifying the time stamp of the selected objects. If you don't want the time to be modified, clear this area. Check the attributes to which you want the new date and/or time to be applied. - It may seem that the Stamp command does not modify the Accessed time correctly. However, the reason for that is that the Accessed time is updated by Windows when you view the properties of the file. 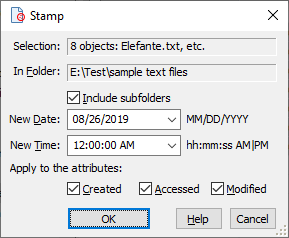 So, if you view the properties of the file after having used the Stamp command, its Accessed time would already be updated by Windows.